"A good landing is one you can walk away from. 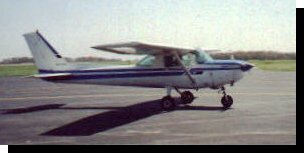 A great landing is one where you get to use the airplane again"
On November 2, 2000 I achieved a long-term goal when I was awarded my Private Pilot certificate by my Favorite Aviation Agency. I passed my checkride on the first try (thanks Dottie!). I scored 93% on my written test (thanks Ken!). Two years later and I am pushing 100 hours. I now do most of my flying from Delaware Municipal (DLZ) where they have a nice variety of rental aircraft. My trusty rented steed N69144. That's me in there! I put up a sign outside my office offering airplane rides. I was surprised at the response I got. I have probably taken 20 different people for rides. Splitting the costs is nice. My two favorite co-pilots. 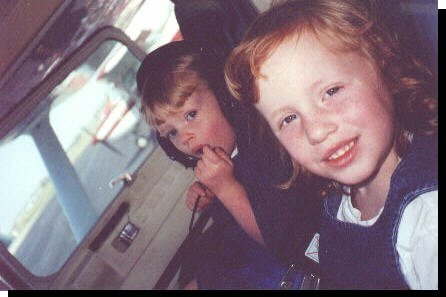 Rachael (the redhead) thinks flying is great. Megan (the blonde) is mad because I would not let her land the plane.